One of the simple pleasures of Santa Barbara is its proximity to the ocean. With miles of sun-drenched and sandy coastline, you’ll have trouble picking which of its pristine beaches to visit first. From surf-friendly waves to a gentle ocean, a visit to Santa Barbara beaches makes even a perfect day that much better. Visitors and dog lovers jump for joy over Arroyo Burro Beach, better known to locals as Hendry’s Beach. Load up your pooch and head to this flat, dog-friendly spot for a game of fetch along the coastline. Insider Tip: Afterwards, give Fido a bubble bath at the self-serve dog-washing station in the parking lot! For the sophisticated traveler­­­, before hitting the beach, grab a craft cocktail across the road at Four Seasons Resort The Biltmore Santa Barbara. If you’re lucky, you might spot a famous celeb. Once your thirst has been quenched, sunbathe at Butterfly Beach while you catch up on your favorite novel. Insider Tip: Make sure to stay late. Located in Montecito, Butterfly Beach faces west, making it a great place to watch the sunset. Adventure seeking visitors can enjoy a competitive game of volleyball at the numerous courts available along East Beach. If two wheels is more your style, rent a bike at Wheel Fun Rentals and cruise along Cabrillo Blvd., complete with cool coastal breezes. Insider Tip: Family-friendly East Beach is located next to Stearns Wharf and makes your stay a breeze with lifeguard stations, a playground and cafés. Make the most of your beach time with a visit to this “Good Land” beach. Cast a line off the Goleta Pier, or kick start your weekend with a good ol’ barbecue. Insider Tip: Plan to stay the entire day! This playful beachfront location has both picnic and grill areas, volleyball courts and horseshoe pits. Near the Santa Barbara Harbor and the breakwater, Leadbetter Beach is a popular location for surfing, boogie boarding and stand-up paddle boarding. Insider Tip: Before leaving, take an extra few minutes to walk up to Shoreline Park, where you’ll be treated to a bird’s-eye view of the surfers below and get the best views of The Channel Islands. For those wanting a relaxing, laid-back beach day, escape to Summerland Beach. Sit back and simply enjoy the surrounding beauty at this low-key location. Insider Tip: Not only is Summerland Beach dog-friendly, but horse-friendly too. 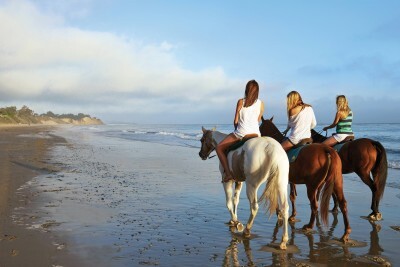 Book a sunset horseback riding tour with Santa Barbara Beach Horseback Rides for an unbeatable experience touring the beaches and backgrounds of Summerland. When visiting Refugio State Beach, be prepared for breathtaking views as far as the eye can see. This palm-tree lined paradise is just a quick 20 miles west of Santa Barbara, and worth every mile. Insider Tip: Spend the night. At Refugio State Beach, set up camp right along the coast, waking up to beach-front bliss every single morning.